Heart-warming story of adolescence, self-esteem & love! Book Blurb: Faith Lane is the girl who has everything. At least, that’s what everyone thinks when they see her rocking a killer dress while laughing with her best friend, Tiffany. But Faith’s life is far from flawless. Her peers torment her relentlessly, and her parents expect her to be the epitome of perfection. Criticized and pressured at school and home, Faith retreats into silent acceptance and finds an escape in her passion of dancing. Then she meets Alex – quirky, forever with a pass, and concealing a mysterious secret of his own. And through his encouragement, Faith starts believing in her gift for dance and gains courage to stand up for herself. But will she be able to keep her footing when the events of one night consume her with the need to jump off the rocky cliffs near her coastal home? And what has pushed her to the edge of reason? Adolescence hits us all, along with the many lessons we have to learn about ourselves and others. We all want to be accepted, we all want to feel great and we all want to experience love. The Color of Happiness explores all of these subject matters and I loved every second. It really put me in the mind frame of movies such as The Breakfast Club, Pretty in Pink, Sixteen Candles and St. Elmo’s Fire – to name but a few! Faith Lane experiences teasing and torment from her peers as she has her own individual wardrobe – sometimes she’s a hit and other times a flop. But the teasing upsets Faith and keeps her self-esteem low. If it wasn’t for her best friend, Tiffany, she would be quite alone. However, she is one that is strong enough to stand up for what she believes in, and even when her mother wants her to wear an outfit that she has made looking like the Mexican flag, Faith wears it in a selfless act to spare her mum’s feelings. Tiffany is a strong character – she accepts Faith for who she is, encourages her when she’s feeling low and gives her a great boost when she needs it. We can all do with a Tiffany in our lives. She is the one person that Faith opens up to about her feelings of her peers, school work, her parents, and boys. Faith’s parents can be quite controlling over her life -not wanting her to do too much socialising with the wrong sorts and keeping a very close eye on her grades. Even when reaching 95%+ in her exams, her mother in particular tries to push for more. Faith knows it is because her parents just want the best for her and because they worry, but she needs a release of pressure at times. One day at school changes her life forever. After being teased by an upperman, she is relieved from further torment as his friend, Alex, encourages him to stop. Although dubious at first, after bumping into Alex around the school and having conversations and small flirtatious moments with him, she begins to develop feelings for him and they begin to see each other on a regular basis. Albeit, without the knowledge of Faith’s parents – they are so controlling over her life she feels that they won’t accept her having a boyfriend and therefore feels she has no choice but to keep him a secret from them. Alex soon becomes the love of her life. They share many lovely, intimate and emotional times together. And he really is the boost that she has always needed, giving her courage and building her self-esteem, as well as showing her what true love is all about. The moments with Alex are written beautifully. Alone in her bedroom, she has been watching dancing videos on the internet and practices the moves around her home and in-between classes at school when no one else is around. After noticing Faith do this and knowing that there is an opening with the dance class, Alex (and later Tiffany) encourage Faith to audition. Not really believing in herself, and knowing her parents want her to dedicate time on her studies, she tries to shrug it off. But deep inside she knows that she would love the opportunity to feel free in dance. Being urged to at least try the audition out, she flourishes and her confidence soars. Faith’s life comes crashing down when there is a major twist in the story with some very unfortunate events. The reader is taken on a journey with Faith as she tries to piece her life back together. It is extremely touching in parts that may bring a tear or two to your eyes. The Color of Happiness is a powerful read with so much meaning. It puts the message across for all of us, not just adolescents, to ‘have a go’, even if in doubt. That during dark times you can pick yourself back up. It is a huge confidence boost, uplifting and a great read for any teen, as well as a motivation boost for those feeling down or those with low self-esteem. The story provides courage and faith to all those that read it, which is exactly what Alex does for Faith’s character. It is a great debut from author K.P. Gazelle! 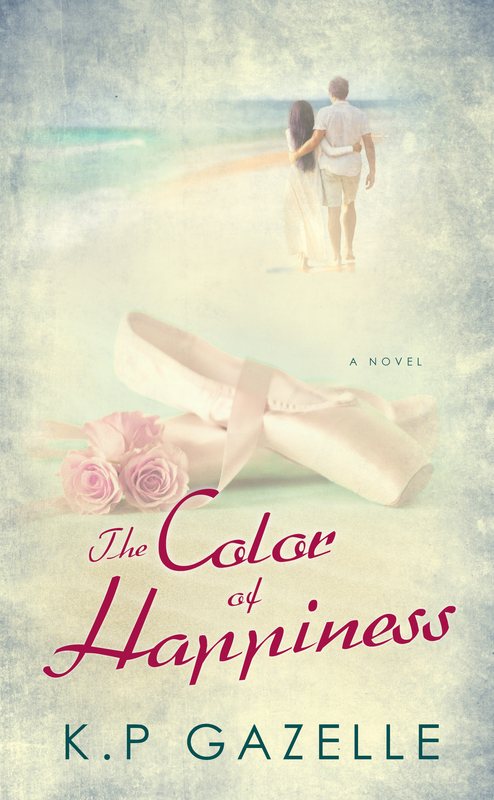 An ARC copy of The Color of Happiness was provided by the publisher in return for an honest and fair review. The Color of Happiness is available at Amazon US and Amazon UK. Welcome to A Reader’s Review Blog. We would like to thank you for participating in our interview for The Color of Happiness. Where did your inspiration come from to write The Color of Happiness? Different events and people inspired different parts of the book. The element of grounded friendships was inspired from my personal life. I have the BEST friends! Can you relate to any of the characters in The Color of Happiness, either personally or through a friend? I can relate to Faith in certain ways. Like Faith, I put a lot of pressure on myself to excel and do the best that I can. Your character, Faith, escapes her peer pressure and the pressure from her parents through dance. Has dance ever played a part in your own life? Nope! I’m more like Tiffany – Faith’s best friend – in that regard LOL. Couldn’t dance if my life depended on it! Can you tell us more about Alex, and the effect he has on Faith? Alex, of course, is Faith’s love interest in the book. He’s one of the people who really get Faith to start believing in her dance abilities and in herself as an individual overall. Were any particular areas of the story more difficult to write than others? Definitely, yes. Sometimes, it was difficult to share the exact emotions a character was experiencing at a given time. Hmmm . . . I don’t know if I have a set style. I like to write in character, so that changes each time. Are you an avid reader? Do you have a favourite book/author? Yes! I absolutely LOVE to read! I love too many books and authors to pick a favorite . . . When you are not writing, what do you do like to do? What is next for K.P. Gazelle? You would probably find me reading. I also enjoy taking pictures, although I’m not very good at it LOL. There’s been an idea rattling in my head for some time. Let’s see what happens with it! Thank you for your time. We wish you every success with The Color of Happiness!